Twirl! Spin! Twirl! That’s what Amber loved to do more than anything else. 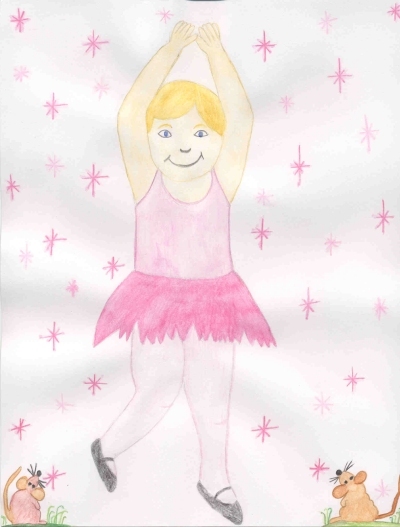 When she put on her pink ballerina outfit, she twirled and twirled and spun about in circles. When she wasn’t practicing her ballet, she was out in the woods, playing with the animals. The mice, the squirrels, the foxes, the deer, the birds, the hedgehogs and even the insects loved it when Amber came to play. She’d usually find a place to sit in the soft grass and the animals would gather around her. "When are you going to dance for us?" Marshmallow, the mouse, asked. "We want to see you twirling and spinning," said Rupert, the fox. "My mum doesn’t think I’m old enough to perform yet. I’m only six," she smiled. She started petting Jasmine, the squirrel. "She said I might be able to dance for her tonight. One day, I’ll do it for you," she told them. "Dance for us now," a robin whistled. "Dance for us now, right here, in the woods," it pleaded. "I don’t have my ballerina outfit on. Why don’t I just tell you a story," she said, changing the subject. The animals gathered around and listened as she told them about the delicious food her mum was baking. "My mum gets up every morning and bakes bread. Oh, it smells so good. She makes me porridge, or fried eggs and sausages with toast. Sometimes she bakes raisin biscuits and scones." Amber reached into her pocket. "I’ve brought some for you all," she laughed. "Goodie," chuckled Marshmallow, "raisin biscuits for us." She danced around with glee. Amber broke the biscuits into little bits and tossed them on the grass. "There. That’s enough for you all to have some," she said, wiping the crumbs off her hands. "My mum cooks big pots of stew, with chunks of beef, onions, potato, turnip, leeks and carrots. They are smothered with thick, brown gravy that is delicious. I couldn’t bring you any of that," she giggled. "That would mess up your pockets," Rupert said. "Yes, it would make a big mess," Amber laughed. "Sometimes she makes blueberry pie and pours cream on it. Sometimes I get to help her, but my favorite thing of all to eat is shortbread. It’s creamy and sweet, buttery, and sometimes sprinkled with caster sugar. I’ve got some in my pocket for you," she laughed again, knowing the animals would be happy. She pulled out a brown paper bag, opened it and poured the bits of shortbread into her lap. She then broke it into little pieces and tossed it on the grass. "Mum says this is old and gave it to me to feed it to my animal friends." "I love shortbread," said the deer. "Me too," squeaked Spike, the hedgehog. When the animals were finished eating their shortbread, Amber jumped up. "It’s time for me to go home now. Mum said I might be able to perform for some of the neighbors tonight. I’ll come back tomorrow. Cheerio," she called and ran off. At home, her mum was waiting for her. A freshly baked rhubarb pie sat on the window ledge. "Mum, you baked a pie. Is it for me? Rhubarb is my favorite," Amber said. "I’ve got a wee surprise for you, Amber. I’ve invited Mrs. McGregor and Mr. and Mrs. Baird over to watch you dance. I baked the pie to serve them," her mum replied. "I can dance? Thank you, Mum. I’m going to change into my ballerina outfit right now," Amber giggled and ran off to her bedroom. Soon the guests arrived. Since it was summertime, which meant longer daylight hours, chairs were set up in the back garden. When Amber came outside, Mrs. McGregor, Mr. and Mrs. Baird and, of course, Amber’s mum, all began to clap. Amber was so happy and so proud. "Doesn’t she look lovely tonight," Mrs. McGregor said. "Her golden hair and wee, black, ballet shoes just add to the pink, frilly costume." She patted Amber’s mum’s hand. The music began and Amber started to twirl and spin all around. As she danced, she spotted her animal friends. They’d come to watch. The squirrels and the birds were in the tree. The deer hid behind the bushes. The butterflies and ladybugs sat on a branch of purple heather. The fox and hedgehog sat on the grass along with the wee mice. She felt so happy that they had come to watch her perform. When she finished, she bowed. She waved hello to the animals. Everyone clapped, including her animal friends. Amber had never felt happier in her life.